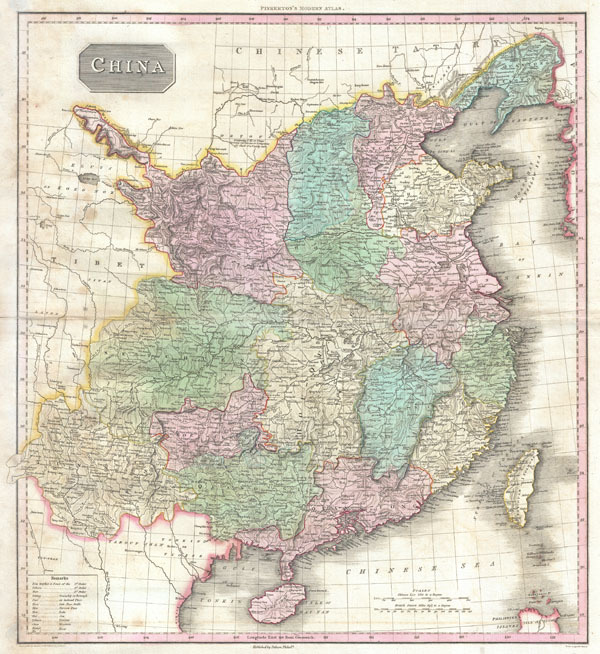 John Pinkerton's highly decorative map of China, published 1818. Covers the China from Chinese Tartary to the kingdom of Tonkin (modern day Vietnam) and from Yunnan to Formosa and Korea. Includes the island of Formosa, alternately labeled Tai-ouan. Macao is noted. Hong Kong island appears, but is not identified. Notes both the Great Wall of China and the 'Barrier of Wooden Pikes Dividing the Province of Quantong or Leaotong from Tartary.' Identifies cities, towns, palaces, fortifications, swamps, mountains and river systems. Lower right hand quadrant features two scales, British Miles and Chinese Ly. Drawn by L. Herbert and engraved by Samuel Neele under the direction of John Pinkerton. This map comes from the scarce American edition of Pinkerton's Modern Atlas, published by Thomas Dobson & Co. of Philadelphia in 1818. Good condition. Original centerfold. Dampstaining in left hand quadrants - please examine image. Blank on verso. Rumsey 0732.034. Phillips (Atlases) 724. National Maritime Museum, 409.